This includes a vintage Vietnam Service Medal and matching ribbon bar. The medal was created by sculptor Thomas Hudson Jones, a former employee of the Army's Institute of Heraldry. 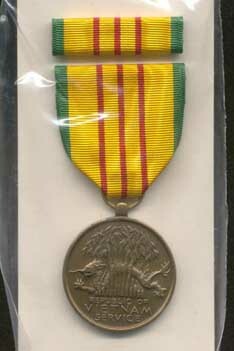 The service medal was awarded to all members of the armed forces who saw service in Vietnam and contiguous waters and airspace between 3 July 1965 and 28 March 1973. In addition, personnel serving in Thailand, Laos or Cambodia in direct support of operations in Vietnam during the same time period also were eligible for the medal if they met the specified criteria. This one is new in the box of issue. It was manufactured in 1969, but written on the box in grease pencil is 2/70.